Anniken Hauglie is changing working hour regulations and strengthening legislation protecting whistleblowers. Together with the social partners she wants to draw clearer lines for what staffing agencies can and cannot do, strengthen work against work related crime and she invites Nordic colleagues to discuss what the sharing economy and new trends will do to the future of work. "Of course labour issues are becoming increasingly important," says the Minister of Labour and Social Inclusion Anniken Hauglie. She is responsible for labour market, working environment, pension and welfare issues and has been a government minister in the Conservative and Progress Party coalition government since 16 December 2015. She took over from Robert Eriksson from the Progress Party. Anniken Hauglie has been a City of Oslo commissioner for knowledge and education and for health and social services. She has also held a range of political positions and roles for the Conservative Party since the mid 1990s. Anniken Hauglie is enthusiastic about social entrepreneurship and innovation. The Nordic Labour Journal has witnessed several of her meetings with the trade. The latest time was when she invited people to come up with ideas for new policies in the field, and the hall was filled to the brim with social innovators and entrepreneurs who wanted to tell her where the problems lie. "This is a growing trade. More and more people consider themselves to be social entrepreneurs and more and more are interested in the entrepreneurship part of working with social issues. That is interesting," says Anniken Hauglie after spending two hours listening to a plethora of ideas from the participants while taking a lot of notes. She sums up the ones which have caught her imagination. "What is important going forward is to also promote the entrepreneurship part of working with social issues, to work with the public sector and others to establish new businesses and profitable workplaces in a way that helps solve important social tasks." Several of the participants said many municipalities say no to commercial players and social innovators, which means they cannot provide any of their services. They wanted the government minister to take action. "It is important to highlight concrete examples to secure potential cooperation. Some say we should increase the economic contribution, but what is important now is to figure out how more companies can get in and become pure providers of services through public procurement and tenders," the government minister tells the Nordic Labour Journal. She refers to an interdepartmental working group which will carry on working with the ideas from the meeting. This will be debated during the Nordic conference on the integration of refugees into the labour market in June. This is about jobs and it is about inclusion. So far politicians have not been successful enough with either. The latest figures from Statistics Norway show unemployment has fallen by 0.6 percent to 4.2 percent of the working population, but a smaller proportion of the whole population is working. The employment level is now at 66.8 percent for people between 15 and 74. 71,000 15 to 29 year olds are outside of the labour market, and then there is the challenge of integrating refugees. The number of temporary workers has also risen since the government made changes to the labour law which made it easier to issue short term contracts. The minister wants to do something about this. She is now presenting new initiatives at breakneck speed. The blue-blues, as the coalition government is known, has been in office for three and a half years. On 11 September there are new parliamentary elections. The result is hard to predict. Anniken Hauglie will be presenting several things this week. She wants to tighten the regulations surrounding the work assessment allowance, there will be better follow-up of recipients, fewer people should be able to claim this and incentives to get people to work or join activities will be strengthened. There will be changes to the working hour regulations, the start of night work will be moved from 9pm to 11pm. The framework around whistleblowing will be tightened, and she has invited the parties to present ideas for how to solve problems surrounding the hiring of staff, including the use of temporary contracts. The government also wants to introduce limits to how long people can work in temporary positions in the public sector. "The state sector is among the worst, especially universities and university colleges. The government now wants to cut the time you can temporarily employ someone from four to three years." Anniken Hauglie is heading the Nordic ministerial cooperation on labour and social issues. A conference on youth, work, education and mental health has already been held. In May the sharing economy takes centre stage, and in June there will be a conference on the integration of refugees into the labour market. "We know that the labour market will change a lot, but we don't know how. The sharing economy will be part of this. It challenges terms like employee and employer. Our rights and legislation, like the working environment act, are linked to these terms, as are forms of employment. The sharing economy challenges all this. 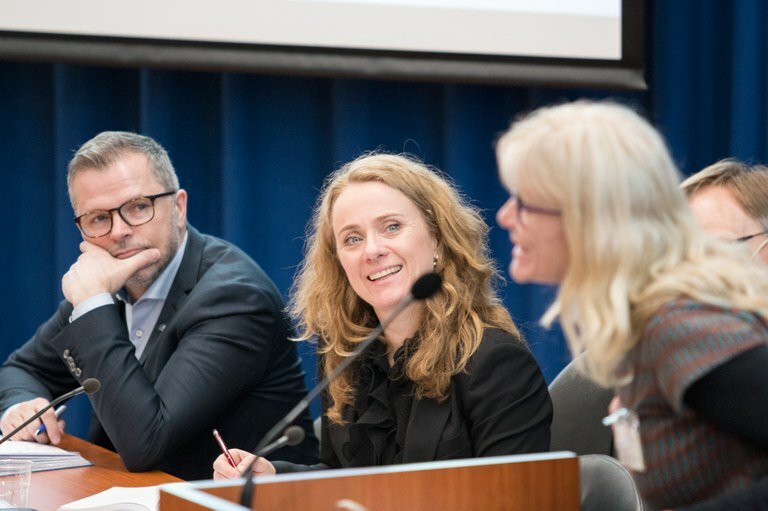 In May we will host a Nordic conference where researchers, politicians, companies and the social partners will discuss the future labour market. We don't know that much about what this future will look like, but we see certain trends and we can influence developments introducing some regulations and frameworks. "But I think we must adapt the law and regulations to fit what we believe will be coming, also in order to introduce some frameworks for the labour market. For instance when we change the starting point for night shifts from 9pm to 11pm. "Many young parents prefer to work late in the evening. I remember when I was a city commissioner and my children were three and five, I preferred to get my laptop out after the children had gone to bed and spend as much of my time with the children while they were awake. They went to bed at eight." So this is familiar to you? "Absolutely. So if we can adapt working hours to fit the lives of today's parents of young children and others who need flexibility, it's a good thing. Of course it will not work for everyone, but we also see that many who have shared parental responsibility prefer to have the children one week at a time, and they want to spend as much time with them as possible during that time. The question is how you can create regulations which take such issues into consideration." There is more demand for flexibility in the labour market now, she thinks. "When I was a city commissioner for social affairs in Oslo, I went on a study trip to Bergen and saw how their solutions with different rota patterns worked. I visited a home for people with mental health issues and a home for people with complex problems and various diagnosis where staff worked longer periods of time with longer periods of continuous leave. “An evaluation from the Fafo research foundation showed very good results for the users. So I asked the staff what they felt about it. They said they liked working several days in a row, and to do other things when they had time off." "Firstly, we gather everything that has to do with whistleblowing in a separate chapter in the working environment act to make it easier to find and highlight the regulations. Secondly, the law will also cover contractors. Thirdly, all companies with 10 or more employees must have routines for whistleblowing and fourthly, the whistleblower must be secured anonymity when public authorities have been alerted." The government has also established an expert committee to consider further issues on freedom of speech and to look at whether there is a need to create a separate ombudsman for whistleblowers. The whistleblowing committee will present its findings by 1 March 2018. What is your view on the idea of an ombudsman? "I am in two minds about it. It depends on the role of such an ombudsman. Some have the mandate to make decisions, others can only highlight various issues. But we will have to wait and see what the committee recommends when it has done its job. "Whistleblowing is the responsibility of the leadership, and it is important that there is a culture for whistleblowing in the workplace. There might be professional disagreement in a workplace. That is not whistleblowing. Whistleblowing is when something happens which is illegal or of a highly questionable nature. But there must be a culture for raising disagreements and serious issues. This is the responsibility of the leadership." The Nordic countries are more different that we might think, yet much is still the same. The labour market model is fairly similar. We see this when we meet on a European level. When we have discussed different directives, like the directive on the posting of worriers and the enforcement directive, the Nordics stand together. We all agree that wage setting must happen on a national level and that this is the social partners' responsibility. This is also being challenged now? "Nobody wants to change the social partners' responsibilities. Nor the three-partite cooperation. "The Nordic model is strong, and all of the Nordic countries are very interested in protecting it. That is why it is very important that we discuss the sharing economy and the new labour market, that we talk things over and exchange experiences. The integration of refugees into the labour market is another topic which is important to discuss, because we share many of the main ways in which the labour market is organised." “Work related crime is a major issue," says the government minister, and refers to the action plan against work related crime which was published in 2015 and the revised strategy from February this year. "It is important to us to support the serious work and be tough on cowboy operators. "We have also strengthened the Norwegian Labour Inspection Authority economically and we have strengthened the watchdogs. We have established several offices where the Labour Inspection Authority, tax authorities and police work together, and we have given them more tools to make them more powerful in the fight against work related crime. "The Labour Inspection Authority will also work more to help guide the serious parts of the labour market, and carry out risk-based reviews of areas where they suspect regulations are being breached. But the major resources will be used where we spot illegal activities, and the Labour Inspection Authority will also work more internationally. "Last year I invited colleagues from Poland, Lithuania, Bulgaria and Romania to a closer cooperation just like the enforcement directive has made possible. The directive allows the countries where the workers come from to collect the fines on Norway's behalf, so that the criminals cannot just escape across the borders and set up somewhere else." All this are examples of how incredibly changeable the labour market is. What are your thoughts on that? "Crime has always been international, but this changes along with increased cross-border mobility. We also see how the refugees' situation contributes. Mobility is good, but it also means we get more mobility among criminal elements. So it is good that the Labour Inspection Authority gets more resources, and that we open up for more cooperation with labour inspection authorities elsewhere in Europe, that we can get together and exchange experiences and learn from each other. Because the criminals are very creative and we must be prepared to counter this." I am reading 'A Little Life' by Hanya Yanagihara. A journalist of diplomat. I don't think I would have been very good at the latter.